Nearly 90% of consumers read online reviews to evaluate the quality of a business before they make a purchase from that business. About 40% of consumers will form an opinion about a business after reading three (or less) online reviews. Now consider this: prospective clients are not the only ones checking out your online reviews. Search engines like Google also evaluate these reviews. When businesses have more positive (and more recent) reviews posted online, Google tends to see these businesses as more “valuable.” And that typically means better rankings for these businesses’ websites. You could be giving away new leads and clients to your competitors who do have these reviews. Your website is likely not performing as well in search as it could. Here’s the good news: There are various things you can do to motivate your satisfied clients to post positive feedback for your firm online in order to boost social proof for your brand and enhance SEO for your firm’s site. Ask clients for reviews in person – At the end of the client experience (i.e., after the service has been fully provided), ask your client in the final meeting to review your business online. An in-person request can be compelling, especially if you have developed a relationship with the client. 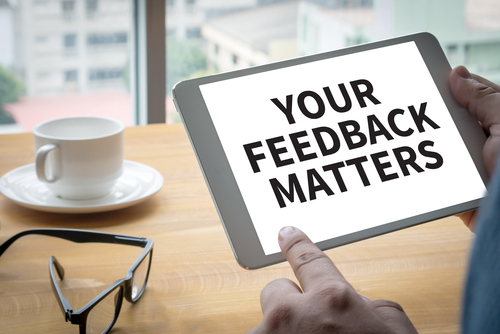 Request reviews on your website – In your calls-to-action, on landing pages and on the Contact page on your site, directly ask for online reviews. Peppering these requests in multiple places on your site can increase the chances that users will see and respond to them, regardless of how they enter or navigate your website. Ask for reviews on social media – Put up social posts requesting reviews for your business. Adding links (and images) can make these posts more engaging and compelling. Request reviews via email – Deliver your request for online reviews directly to your clients’ inboxes. These emails can even include “incentives” for these reviews, like free eBooks, special offers or discounts, etc. Add a review request to your email signature – This is a more subtle way to incorporate requests for business reviews into any email you send clients. Be sure to include a link to the review page (or site) where you want these reviews posted so people only have to click through to get a review started. Follow up – Regardless of whether you request reviews in person or online, set up a process for following up with your clients and reminding them to complete their reviews. These reminders can be helpful motivators, especially if clients get busy or distracted before they can finish posting a review. Make it as easy as possible for clients to review you – The easier you make it for clients to review your business online, the more likely they will do it. So, think about how you can facilitate this. Consider providing “starter” language or even just a simple rating system that clients can use. Don’t copy and paste reviews from third-party sites onto your site – Copying reviews from third-party sites (like Yelp) and adding them to your site or social pages can be seen as “disingenuous” and not providing any new value. This can undercut the benefits of having reviews. Don’t try to create fake reviews – Search engines and your online audience can be better at detecting fake reviews than you think. And it only takes a few fake reviews to damage your firm’s reputation and rankings online. Don’t get discouraged if you get a few negative reviews – Getting some negative feedback online can be inevitable. If you find that a few reviews for your firm are less than positive, stay focused on getting more good reviews that can outweigh the negative ones. Try different calls-to-action for reviews – Change up the language you use for requesting online reviews. Consider pairing these calls-to-action with images or videos (like videos showing someone how to post an online review). This can help you figure out most (and least) effective way(s) to ask for online reviews. When you are ready to enhance your firm’s online presence, contact the SEO & attorney marketing professionals at Epic Web Results by calling (303) 515-7191 or emailing us. Up to date with the latest advances in Internet marketing and SEO best practices, we are highly adept at developing custom attorney marketing solutions that can improve site rankings and traffic. Our extensive experience delivering the best possible online results for our clients empowers us to consistently provide cost-effective Internet marketing solutions that can ultimately help grow our clients’ businesses. Our goal is to provide your business or firm with aggressive, effective Internet marketing solutions that will help attract new clients while continuing to engage existing clients. Let’s talk about your options. We’re ready to audit your site for free and provide you with recommendations on how to improve your brand’s online visibility.